Yeah, I find the DS-X pretty sweet myself. If they keep their promises, it will be the simplest (although not the cheapest) homebrew solution for the DS so far. The company behind it also seems to be very homebrew-friendly. For example, they announced they will be sending free unit to homebrewers with interesting projects. So, I also applied for one. As mentioned on their blog, the device supports FAT-enabled homebrew. That means that NT probably already works with it, and if not then it is a matter of minutes to compile it with another FAT library such that it works. 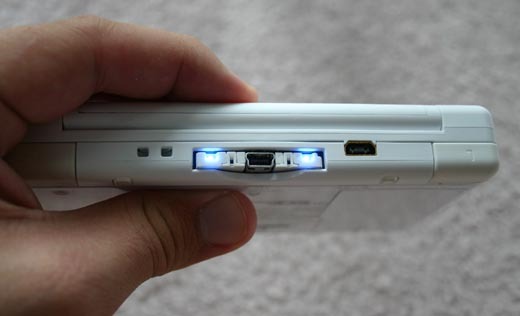 One particularly sweet thing about the DS-X is the USB port. If they release a library for use in homebrew applications for accessing the USB port, it might be possible to use the DS as a regular USB MIDI device! Whoa, that last line got my attention! The DS-X is indeed pricey, at a whopping US$124.99 for a 512M unit, though if you can round some friends together you could bulk buy them. Even at that price, though, these features could potentially be worth it.